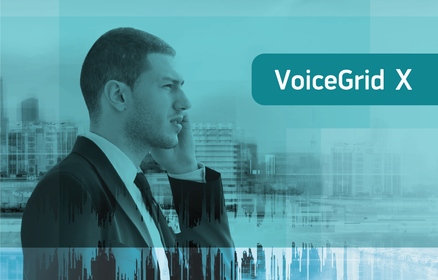 VoiceGrid X is an application that enables automatic detection of specified voices in phone conversation recordings. VoiceGrid X is a high-end application for speaker voice identification in large audio databases. It prevents call center frauds. It Increases internal investigation efficiency by using recorded calls. VoiceGrid X enables you to significantly enhance analysis of audio recordings. VoiceGrid X processes speaker voices in recordings and automatically skips audio files without specified voice features. Release your call center agents from time-consuming work with VoiceGrid X.
VoiceGrid X is an out-of-the-box voice biometric solution designed by Speech Technology Center. Biometric technology enables you to analyze biological features of a person (e.g. fingerprints that are the most common biometric features nowadays). As for voice biometrics, it is able to measure voices and compare them against each other in order to identify a person or verify such person's identity.